ST. LOUIS, Mo. – August 14, 2012 – Simutronics today announced One Epic Knight, a new game from the creators of the immensely popular and award-winning Tiny Heroes. 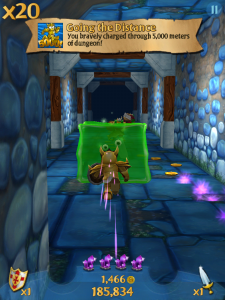 A fresh addition to the free running genre, One Epic Knight will launch for free on iOS devices everywhere August 23. With simple controls, numerous upgrades, and addicting gameplay, One Epic Knight will take fans of free-runners to a level of epicness they never thought possible. In One Epic Knight, players will take control of an Epic Knight whose only quest in life is to acquire as much loot as possible. 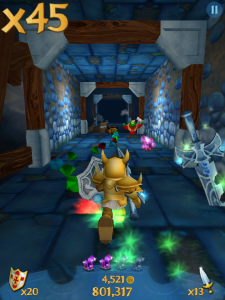 Gamers will control Epic Knight as he charges his way through an ever changing dungeon maze, maneuvering him to avoid spike traps, lava pits, and other hazards while searching for secret passages and treasure rooms. To aid in his journey, Epic Knight can pick up swords to slice enemies, shields to break walls and spikes, crystals for speed boosts, and a leg of meat to clobber anything and everything in his path. With collected treasure, gamers can upgrades Epic Knight’s armor and weapons, in addition purchasing new outfits and power-up potions. There is no stopping this Epic Knight in his quest for epic loot. Founded in 1987, Simutronics Corp has built a reputation for inspired design, incredible game experiences, first rate customer service and dedicated gaming communities. Located in St. Louis, MO, the privately held company has entertained millions of players for over two decades, and is committed to creating outstanding game experiences for a global audience.